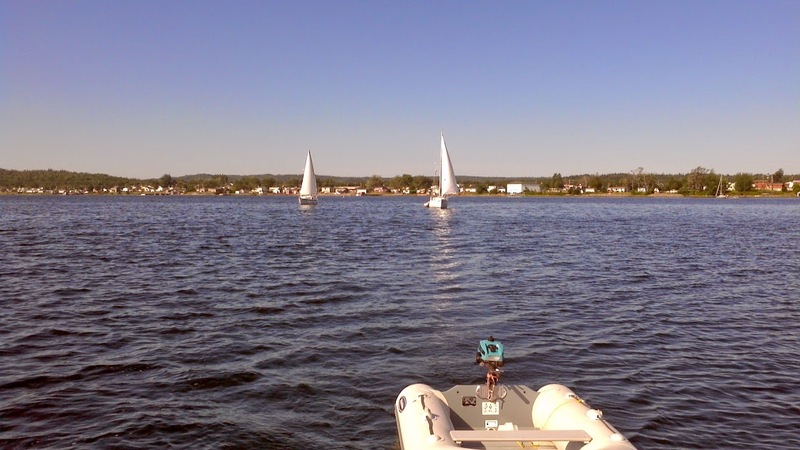 On Friday, August 2, 2013, before 0930, three boats went out for a day of sailing. Peter (another one) and Jim were aboard a Bayfield 25, Steve was solo on his Challenger 24, and I was single-handing Serenity. 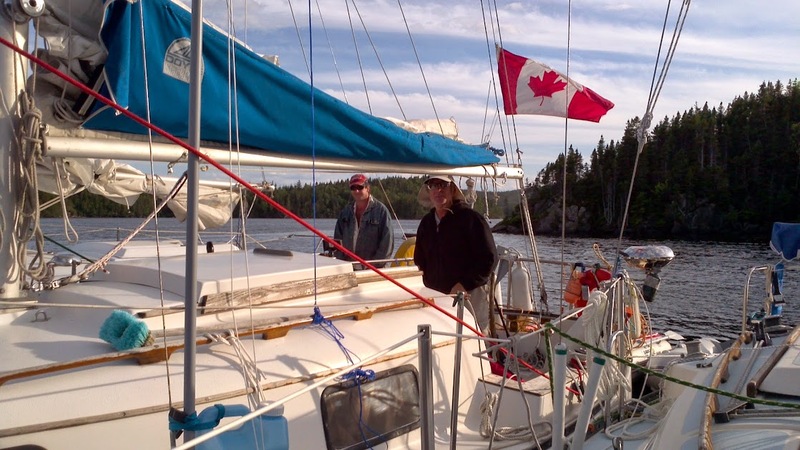 Jim is fairly new to sailing, and restored a 1960s era Alberg 22 after he semi-retired. This is his first season using it. Peter has been sailing about 70 years, and taught most of the sailors at our marina, as well as many in Ontario during the years he lived there. This was an informal training session for Jim. Steve has not been sailing all that long either, but he gets out on his boat fairly often, usually alone, so he is a competent sailor. This was my first long trip aboard my PY23 since 2008, and I'd made a few changes since then. I was also towing my dinghy, and that was a new experience for her. Winds were light as we departed, but I managed 3+ kts for a while. This didn't last long, however, and we had to fire up our engines to keep us moving. We had no set plans, just to follow the wind, and be home around dark. We considered going overnight, but the forecast was calling for showers on Saturday. That will have to wait for another time. 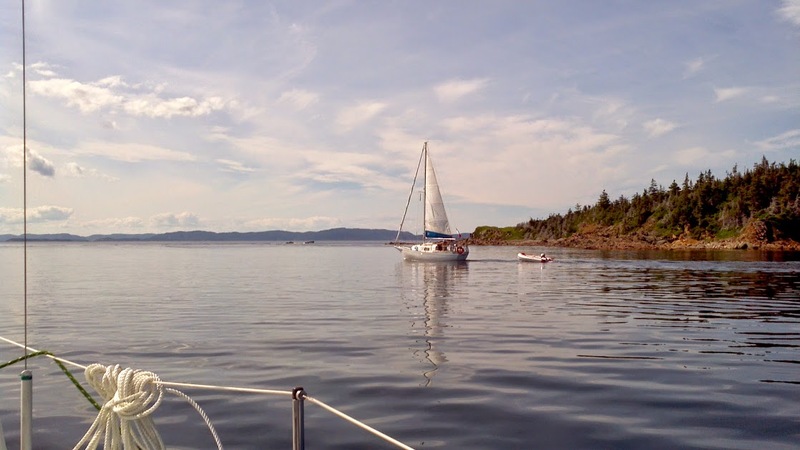 We were sailing in the Bay of Exploits, which is contained within Notre Dame Bay, on the NE coast of the island of Newfoundland. This is where I grew up boating. 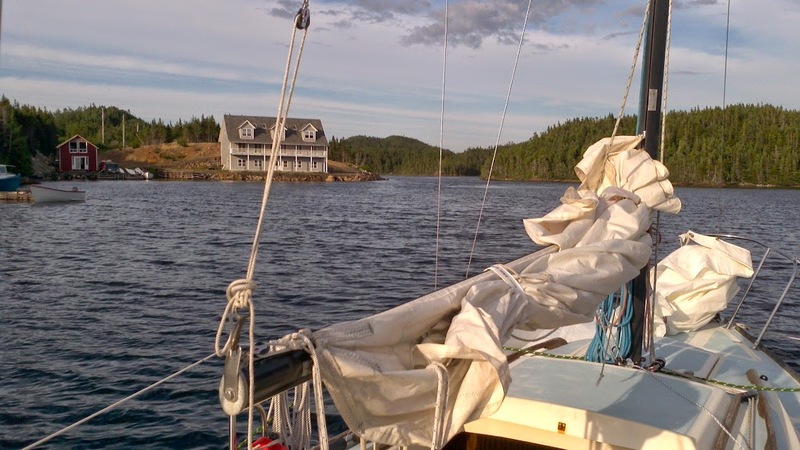 The waters are fairly sheltered, with many islands, and lots of safe harbours. 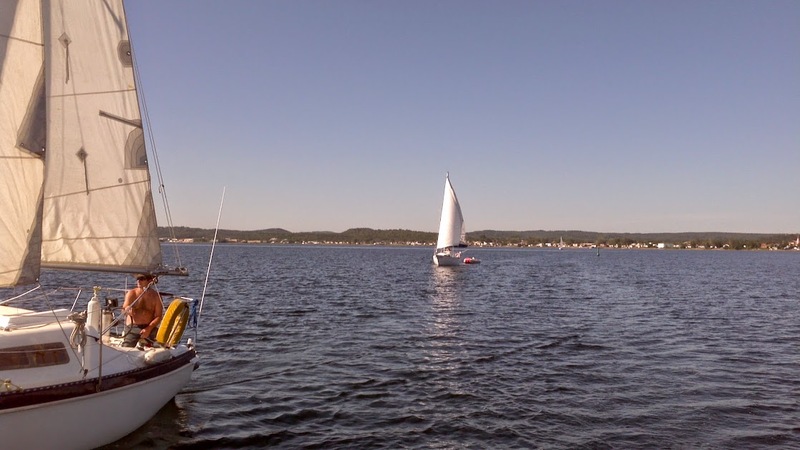 The Lewisporte Yacht Club has about a dozen moorings scattered around, making it convenient to stop for a meal, or a night. 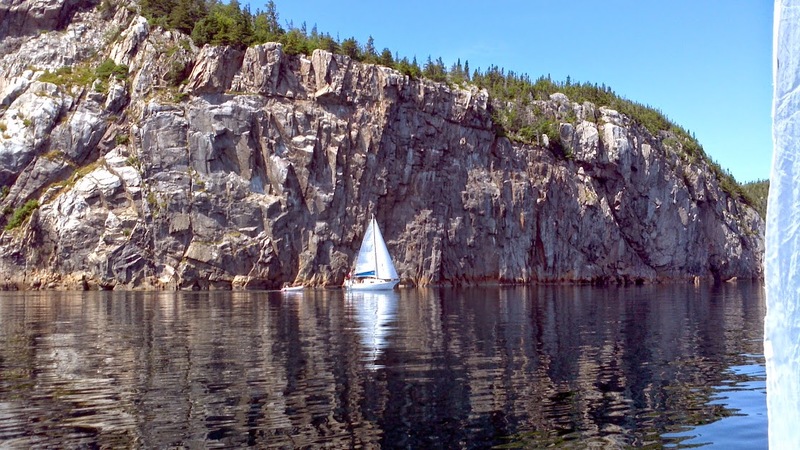 The water is deep too, and you can sail right up to some cliffs. There are a few hazards, but keeping an eye to the charts will keep you in safe waters. We stopped for lunch around 1300 at Western Harbour, South Samson Island. It is a very sheltered harbour, and so popular that the LYC has 4 moorings in there. We rafted up on one. There was already a 40' sailboat on another, and a large power boat came in just before we left and took the third. I forgot to get pictures while I was in there, but did just as we exited. From this point on the wind began to fill in from the east. We tacked our way through the tickle between North and South Samson, emerging on the other side to about 10 kts. Serenity peaked at about 5 kts, with the inflatable in tow, and I was pleased with that. We had a good time sailing across the run to Intricate Harbour. This was my first time entering this cove, and it lived up to its name. There are rocks and small islands all the way in, so you have to snake your way around. No hidden surprises, however, so if you don't see it, you are probably ok. This is where we had supper. We could feel the wind picking up while we were on a friend's mooring, and looked forward to a good sail back home. Steve switched to a smaller sail there, and I should have reefed either my main or my jib at that time too, as it had become quite a bit rougher than we had experienced up to now. 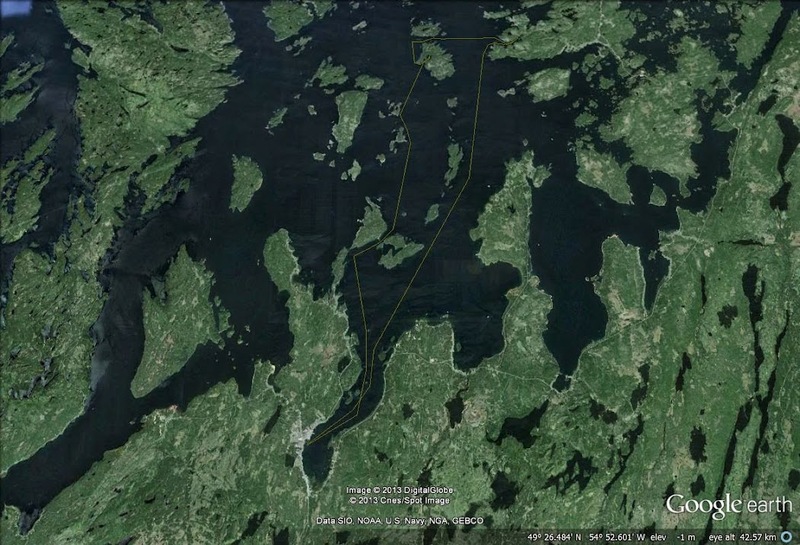 After exiting Intricate Harbour at around 1900, it was a fairly straight shot back home down the main shipping channel into Lewisporte, called Sloop Run. Winds were generally on the beam most of the way, at about 15 kts. There were lots of whitecaps, and a fairly big chop building with the 5+ NM fetch across to the nearest shore. There were no pictures by me from here on. Handling the conditions alone did not allow for such distractions. After motoring out, I put up the main, and decided against using the full jib, so I ran up close to shore for some shelter, and put in the jib's reef. It was an ugly jib, but it was smaller. I need to find a better way to reef it. The unused portion at the bottom was dancing around all the way in. 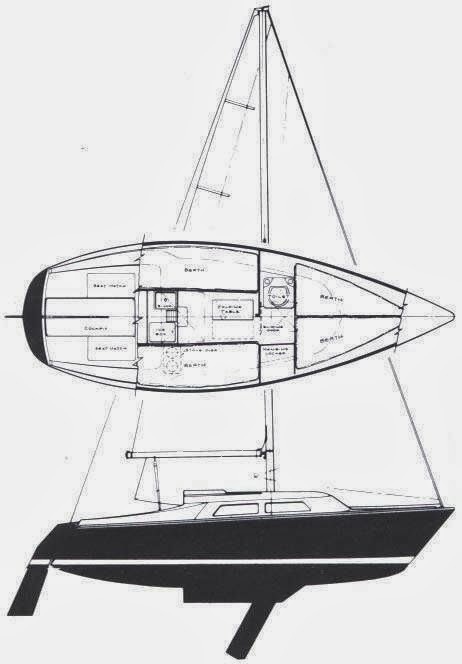 At least the boat was balanced, heeled over no more than 15 degrees, and was often hitting 6 kts, towing the tender and with both outboards still in the water. I saw over 7 kts on the GPSr at times, as we caught a wave to surf. This is where I most enjoyed the trip. It was my first time in such conditions aboard my PY23, and I was pleased how she handled it. Being the smaller boat, and having stopped to reef, I could not keep up with the other two, but we were comfortable, and making good time for us, the boat and I. About 1/3 of the way down the winds started to drop out, and my speed went from 6 to 5, so I let her drift while I rearranged the lines to switch back to the full jib. This was also a good time to lift the main engine out. We gained our knot of speed back. By the time we were halfway down the run, daylight was diminishing. This was part of our plan, as we wanted to give the new guys some experience sailing at night. I was well behind by now, so the Bayfield came back to check on me, and also to extend their time on the water. It wasn't long before I was being pushed around by waves I could no longer see, and following the red and green lights which guide ships into the harbour.